Owners of a car usually have to maintain their car including their car parts regularly, which results in exchanging car parts from time to time. Normally, products made by original equipment manufacturers are used by professional garages because of the guarantee they have to provide. The newly developed decision tool RAUPE is based on data mining methods applied to a data base provided by a car dismantling network that includes around one million spare parts’ data. 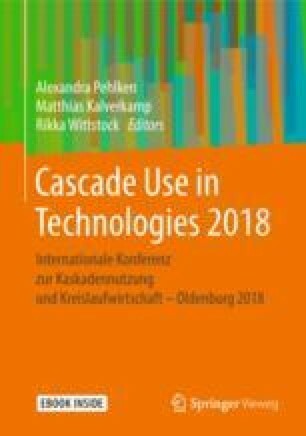 The results of this data mining is included in RAUPE giving information on the reusability chances of the spare parts and the life cycle performance related to its CO2 emissions. The decision tool is in its beta version and is to be evaluated by the end of 2018. The paper describes the concept of RAUPE and the role of its stakeholders. This work was possible through funding the research group Cascade Use by the BMBF with the FKZ 01LN1310A. In addition, we thank callparts recycling for providing the data base on used car parts and Julia Wagner of Kassel University with assisting in some literature studies within her Bachelor thesis in 2017.